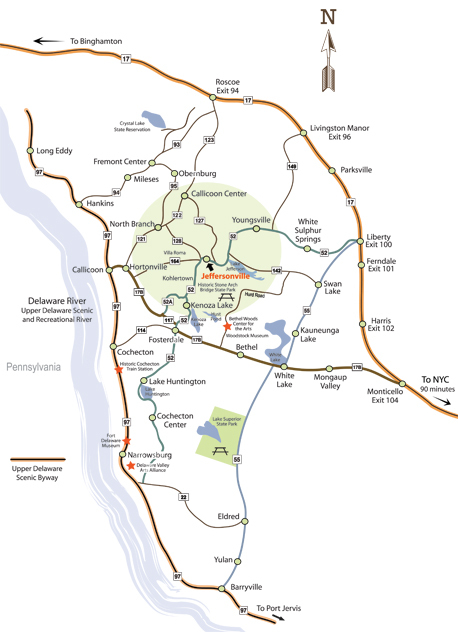 Jeffersonville is only 10 minutes from Bethel Woods Center for the Arts, the Woodstock Museum and the recreational Delaware River. New York State Thruway to exit 16 (Harriman). Route 17 West to exit 104 (Monticello Raceway). Route 17B east to State Route 52 east into Jeffersonville, NY. Route 84 West to exit 4W. Route 17 West to exit 104 (Monticello Raceway).Route 17B east to State Route 52 east into Jeffersonville, NY. Route 17 East to exit 87 (Hancock, NY) to Route 97 South to Callicoon. Left onto 17B east to State Route 52 east into Jeffersonville. Route 6 East to Honesdale, PA. Route 191 North to Callicoon turnoff (right turn). 6 miles to Callicoon, NY. Take 17B east to State Route 52 east into Jeffersonville. Route 9N (NE Extension) to Scranton, PA. Route 6 East to Honesdale, PA. Route 191 North to Callicoon turnoff (right turn). 6 miles to Callicoon, NY. Take 17B east to State Route 52 east into Jeffersonville. Palisades Parkway to Route 6. Route 6 to Route 17 West to exit 104 (Monticello Raceway). Take 17B east to State Route 52 east into Jeffersonville. From the main entrance, travel up hill past tennis/raquetball building. At top of hill take first left, at next stop sign take right. Go straight on CR 164 and make left onto State Route 52.